Just as the motley crew of art historians, curators, restorers and archivists—most of ages and girths that seem misplaced on the battlefield—fights to preserve the veritable treasure-troves of cultural artifacts looted by Nazis in George Clooney’s The Monuments Men, the writer-director-star of the film seems bent on preserving a certain kind of classical, even old-fashioned American movie that Hollywood just doesn’t make anymore. After vigorously investing vivid life into the best of his five retro-fun films, Good Night, and Good Luck and The Ides of March, Clooney’s latest once again looks back towards a rich tradition of filmmaking that springs its morally astute ideas from history, politics and civic ideals, its noble intentions worn proudly on its sleeve. 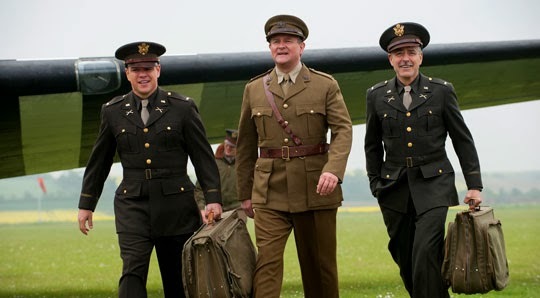 The—very loosely—based-on-a-true-story wartime drama, co-written by Clooney with his producing partner Grant Heslov, draws on the WWII thriller, caper comedy, straight-faced procedural, sentimentally uplifting melodrama and buddy film, and includes just enough why-we-fight speeches to keep the patriotism practical (“They tell us no one cares about art, but they’re wrong. It’s the exact reason that we’re fighting, for a culture, for a way of life. If you destroy their achievements, their history, then it’s as if they never existed.”) The director seems unsure whether he’s trying to make a stylish wartime drama or a jaunty, jocular lark—Ocean’s Seven, WWII edition?—and what he ends up with tries to be funny, thoughtful, touching and true all at the same time but hones a little too closely to a dutiful, dry art-appreciation seminar. On the chase for Michelangelos and Matisses is a ragtime team of misfits and rejects, middle-aged gentlemen and scholars tasked with preventing Hitler from amassing the masterpieces of Western art for his planned Fuhrer Museum or, as the war draws to a close, saving them from destruction or confiscation by the Russian army. More Arty Dozen than Dirty Dozen, bookish and out of shape, the academics and professionals crawl their way through basic training before being set loose amid the wreckage of Normandy and the Bulge. It’s been said that Clooney is the Cary Grant of our time, but the dashing figure he most resembles as Frank Stokes (based on real-life art curator George Stout), the group’s squinty-smiled, pencil-mustachioed leader whose uniform remains impeccably pressed even under the most trying of circumstances, is Clark Gable. 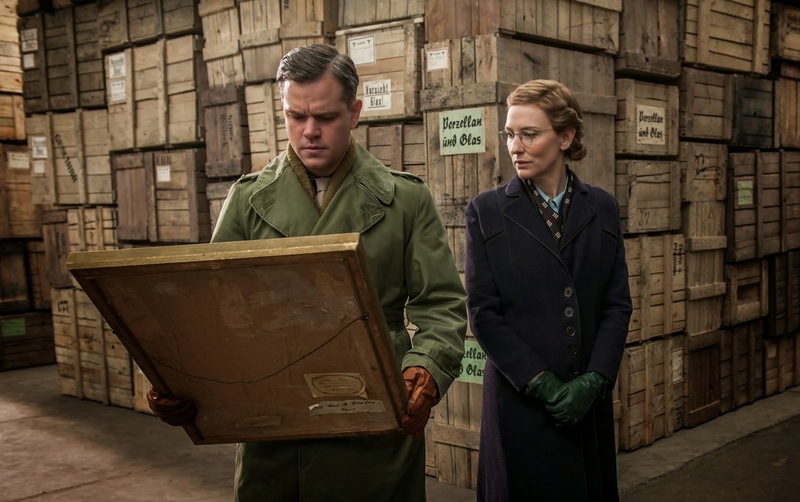 As shrewd as his character, the director has assembled a monumental team of actors to play this unsung band of brothers: Matt Damon, Bill Murray, John Goodman, Hugh Bonneville, Bob Balaban, The Artist’s Jean Dujardin, and Cate Blanchett as a secretary at Paris’s Jeu de Paume, a museum the Nazis used as a repository for their stolen art. The cast brings in 17 Academy Award nominations and five wins between them—with a sixth pending for Blanchett—so it’s not exactly that the performances ring inauthentic; there’s just not enough time to build authenticity. Both Gable and Clooney could play the debonair, wizened man of the world in their sleep; unfortunately it sometimes seems that’s exactly what Clooney is doing here, setting the plot to autopilot as director while the other barely sketched characters allow all of the actors (with the exception of Blanchett) to similarly play themselves. If you think that’s unfair, think about it: can you remember the name of a single character other than Clooney’s or Blanchett’s? The brain trust behind the original Monuments Men was staggering and included individuals who helped run some of America’s greatest cultural institutions. Of course you’d expect their fictional counterparts to exchange a little shoptalk and some thoughts on art, literature and the latest restoration techniques or maybe just gossip about Picasso’s latest mistress. Or maybe that was just me, in which case the average viewer is in luck; Clooney’s film keeps it intellectually light, never asking you to think too hard. There is no denying the movie’s easy pleasures, none the least its men-on-a-mission antics that allow a small unit of guys to trump the enemy’s best-laid plans or the guaranteed satisfaction of watching the Nazis get theirs yet again. In working towards that goal, the quirky crew quickly splits up, which is too bad because the result is a series of disjointed burgeoning bromances that have neither enough genuine chemistry to jell nor the requisite screen time. Most affecting, perhaps, is Balaban and Murray’s section, fraught with affecting scenes both tense and tender as the two forge a friendship out of the initial dirty looks and grumbling, eventually sharing one of those graceful, underplayed melancholy moments that remain with you long after the memory of a not-great movie has dimmed. 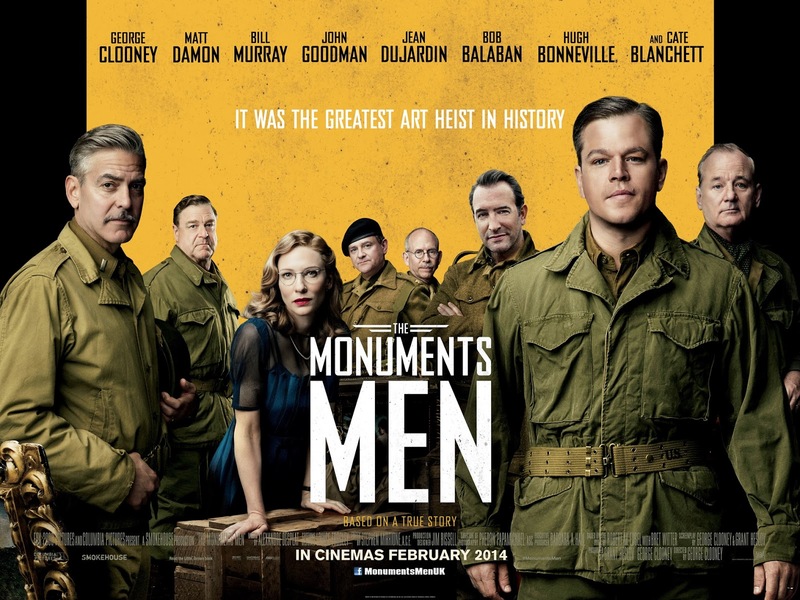 The Monuments Men mixes immersive realism and set-decorated theatricality throughout, sometimes to dazzling effect. Oscar-nominated cinematographer (for Nebraska) Phedon Papamichael’s desaturated palette beautifully captures wide vistas of wartime ruin, while Alexandre Desplat, doing his best John Williams impersonation, serves up an uncharacteristically, cloyingly sentimental score. As the hurdles in the race against the clock, the Nazis and the Russians multiply, so do the directorial missteps. Clooney, however, finds glory in the corners. Some scenes are sincerely felt, as when Damon’s art expert returns a lone painting to the barren apartment of its former Jewish owner, now long gone. At another point, Clooney cuts from a burned Picasso to a barrel of gold-capped teeth. The most provocative—but unfortunately too simplistically answered question in the film—resonates throughout these scenes: after the tide of devastation and loss has laid waste to so many human lives, does it matter if the statue of David is still standing or if the Mona Lisa is still smiling? In these moments, what could have been a modestly enjoyable, entertaining historical piece jolts you with its deep, desperate, devastating humanity. But that’s what the jarring tonal shifts and the unwieldy structure make of Clooney’s movie—just moments, some unfortunately made up of nothing more than formula and cliché, others triumphs of sophisticated drama or irreverent comedy. 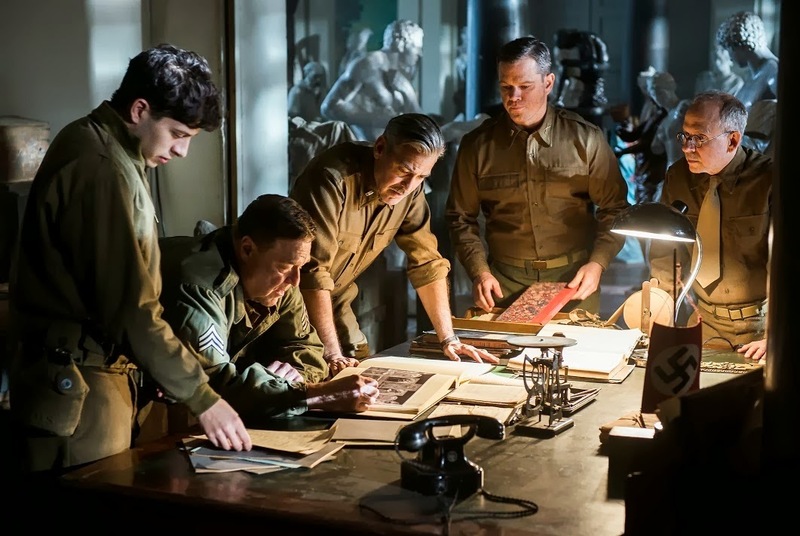 The problem is most of the time The Monuments Men tries to occupy the awkward and compromised middle zone between the two—it’s not very monumental.